Drivers who have their heart set on a midsize sedan can add unrivaled luxury and elite performance to their day-to-day commute when they get behind the wheel of the 2018 Jaguar XF in San Antonio, TX. A fan favorite at Barrett Jaguar, the British-manufactured Jaguar XF will go toe to toe with its German luxury counterparts without skipping a beat. Armed with sleek lines, potent powertrains, luxurious interior designs and affordable prices, the 2018 Jaguar XF will check all the boxes. Available in six trim levels – Jaguar XF, XF Premium, XF Prestige, XF R-Sport, XF Portfolio and XF S – the luxurious and performance-tuned Jaguar XF can be tailored to your specifications. With a price that starts at just $47,775, the Jaguar XF is more affordable than many luxury counterparts and possesses a wealth of standard features that deliver incredible value at every turn. Highlight features include a standard eight-inch Jaguar Touch infotainment system, Jaguar Drive Mode and a 380-watt Meridian sound system. If you are dedicated to unrivaled power and thrills, the 2018 Jaguar XF in San Antonio, TX will deliver on all counts. With the debut of the 2018 Jaguar XF, fans of the luxury midsize sedan were greeted by a brand-new Ingenium 2.0-liter turbocharged four-cylinder power core. Married to an eight-speed automatic transmission, the four-cylinder Jaguar XF will manufacture a fun-to-drive 247 horsepower and 269 pound-feet of torque. Capable of a zero-to-60 mph time of just 6.2 seconds, the Jaguar XF with the brand-new turbo will still make 23 mpg in the city and 30 mpg on the highway. In addition to the new Ingenium 2.0-liter turbo, entry-level Jaguar XF models can be equipped with a fuel-efficient 180-horsepower 2.0-liter turbodiesel four-cylinder engine. Paired with the eight-speed automatic transmission, the diesel-powered Jaguar XF will make 318 pound-feet of torque and will still reach 31 mpg in the city and 42 mpg on the highway. Intelligent All-Wheel Drive with Intelligent Driveline Dynamics is a key weapon in the 2018 Jaguar XF arsenal. Available or standard for all Jaguar XF models, the Intelligent All-Wheel Drive system will deliver precision handling, explosive acceleration and a performance-tuned drive. When you pair an innovative all-wheel drive system with a lightweight aluminum frame, the Adaptive Surface Response system and an Adaptive Dynamics suspension, the Jaguar XF will provide limitless thrills. Drivers who want to take performance to the next level can opt for the Jaguar XF equipped with the world-class 340-horsepower 3.0-liter supercharged V-6 engine. Mated to an eight-speed automatic transmission, the rear-wheel drive XF Premium will vault from zero to 60 mph in just 5.2 seconds. 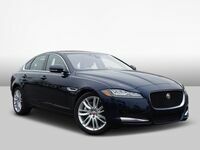 Fuel-economy ratings for the supercharged Jaguar XF will reach 20 mpg in the city and 29 mpg on the highway. Jaguar XF S models employ a refined 3.0-liter supercharged V-6 that will make 380 horsepower and will sprint from zero to 60 mph in 5.1 seconds. Experience the 2018 Jaguar XF firsthand when you visit Barrett Jaguar today! Interested in a 2018 Jaguar XF?